Did you ever wonder why the roof on the Minneapolis City Hall is green? The simple answer is oxidation. 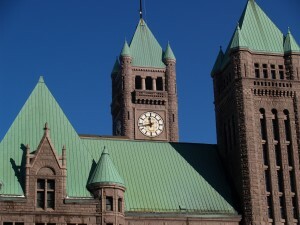 The copper roofing was installed on the Minneapolis city hall in the 1950’s. Over the last 60 years its slowly changed from bright shiny copper through shades of brown and bronze, and finally to the beautiful blue green color we see today. As copper ages its surface reacts with the oxygen, moisture, and sulfides in the air which cause oxidation and form a thin layer of protective film called a patina on its surface. This process continues until a balance has been achieved that slows the patina process to a crawl. The amount of time it takes for this process varies greatly depending on the purity of copper, the different protective oils or coatings applied at the copper mill, the amount of moisture the copper is regularly exposed to, and the contaminants in the surrounding air. Typically copper loses its bright shine in about six to eight weeks and turns brown. Over the next 10 to 25 years the exposed copper will achieve a rich dark bronze appearance then finally develop a green patina. There are different chemicals and processes that can be applied to copper to prematurely give new copper an old look but none are as resilient or authentic looking as the natural patina process that occurs over time.